Definition at line 61 of file sptab.c. Definition at line 58 of file sptab.c. Definition at line 67 of file sptab.c. Definition at line 79 of file sptab.c. Definition at line 89 of file sptab.c. Definition at line 237 of file sptab.c. Definition at line 178 of file sptab.c. Definition at line 165 of file sptab.c. Referenced by ExeFmtpCreateImageSection(), MmCreateCacheSection(), MmCreateDataFileSection(), and MmCreatePageFileSection(). Definition at line 117 of file sptab.c. Referenced by _MmGetPageEntrySectionSegment(), _MmSetPageEntrySectionSegment(), MiSectionPageTableGetOrAllocate(), and MmSetSectionAssociation(). Definition at line 136 of file sptab.c. Definition at line 278 of file sptab.c. 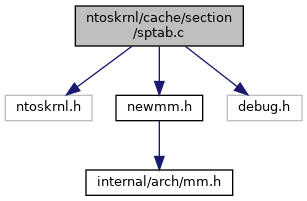 Referenced by MmFinalizeSegment(), MmFreeSectionSegments(), and MmpDeleteSection(). Definition at line 331 of file sptab.c. Definition at line 352 of file sptab.c.